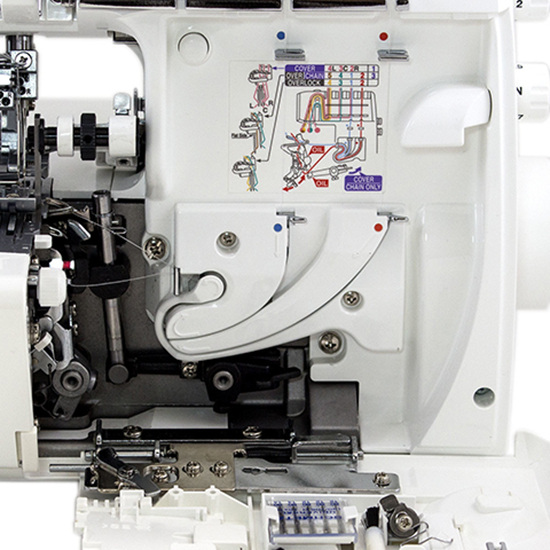 Juki MO-735 5 Thread Coverstitch Serger $959.00 - FREE SHIPPING! If you’re looking at multifunctional Juki sergers, look no further than the Juki MO735. 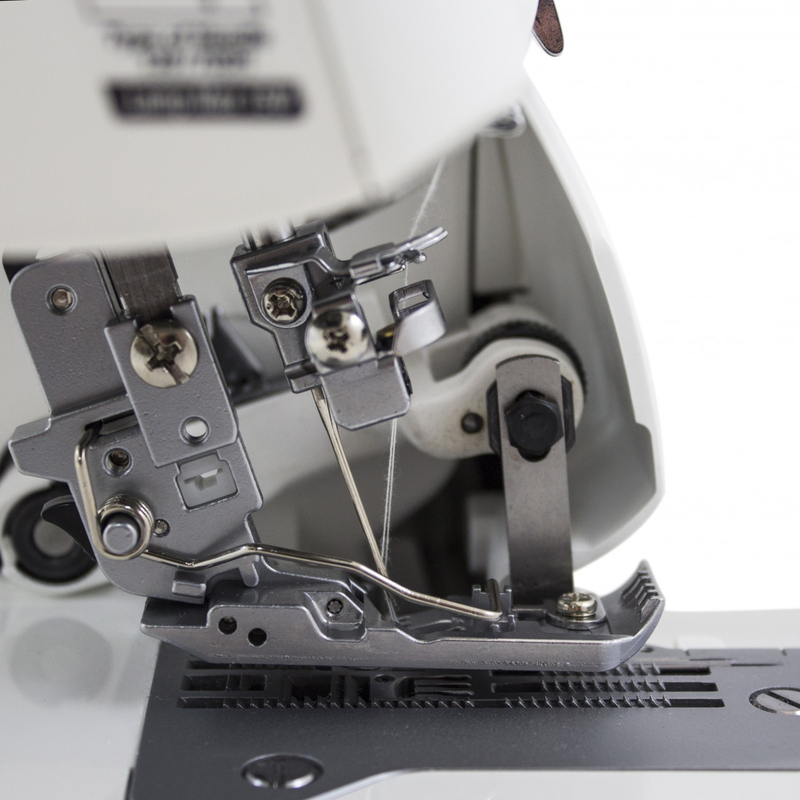 This model functions as more than just a serger; it is also a coverstitch machine. This machine is highly regarded for its versatility, durability, and stitching performance. 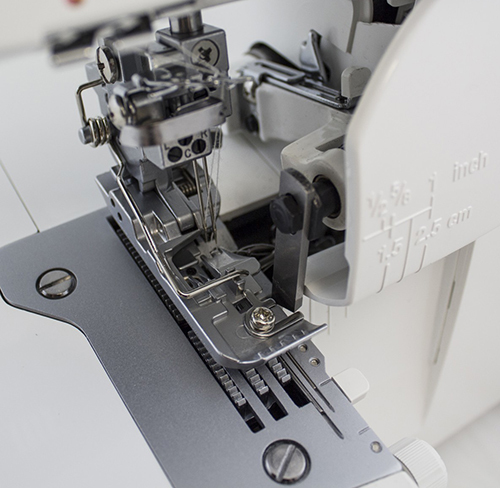 One of the special facts about this multipurpose Juki serger is its capability to stitch a total of 24 stitches, which is almost every type of serger method and creative stitching you would want to use. There is literally no limit to the type of clothing and home decor items you can create! 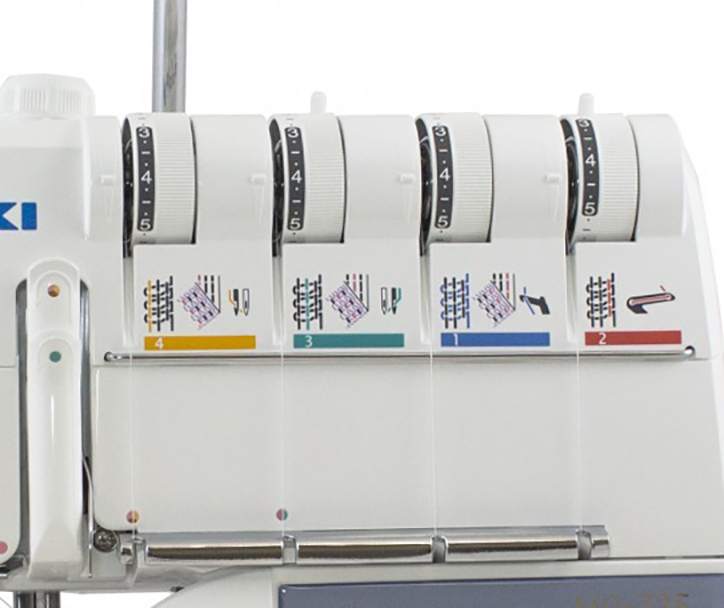 The machine can do a 2, 3, or 4 thread overlock stitch selection, giving you more ways to stretch your creativity to the next level. But wait, there's more! 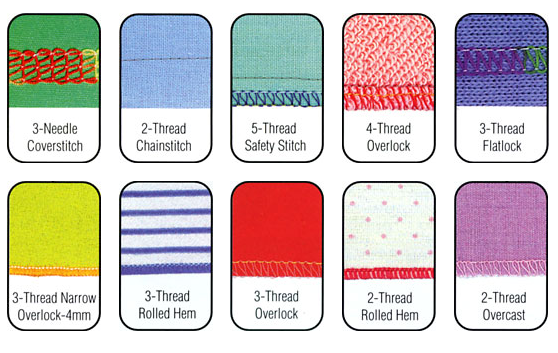 The Juki MO-735 can also do a chainstitch, a 5-thread safety stitch, and even a 2/3 needle cover-stitch. You’re not limited in your choice of fabric – the Juki MO735 can use pretty much any fabric, no matter how light or heavy it is. Another advantage is it can also handle fabrics that can be quite difficult to run through the feeder. You will also appreciate the color-coding on the threading guides that makes it easier to get your machine threaded and ready to go. 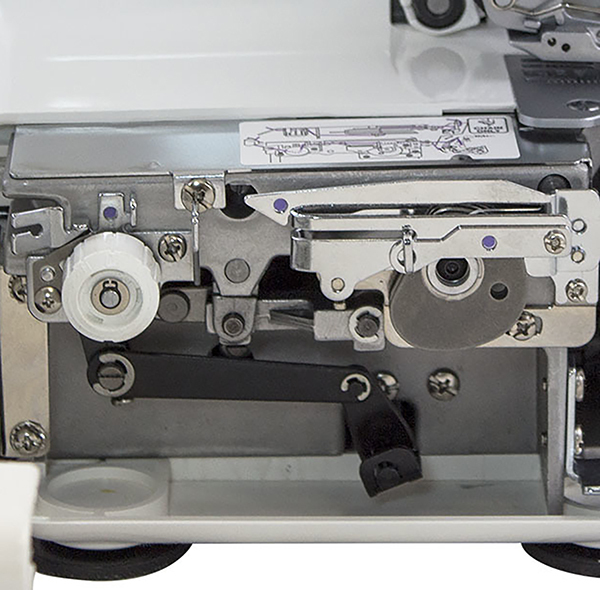 The lower/upper knives make sure that your machine cuts fabric smoothly and consistently. To roll your hems, flipping a switch is all you need to do – it can’t get easier than that! To change stitch length or tension, all you have to do is turn their respective dials. 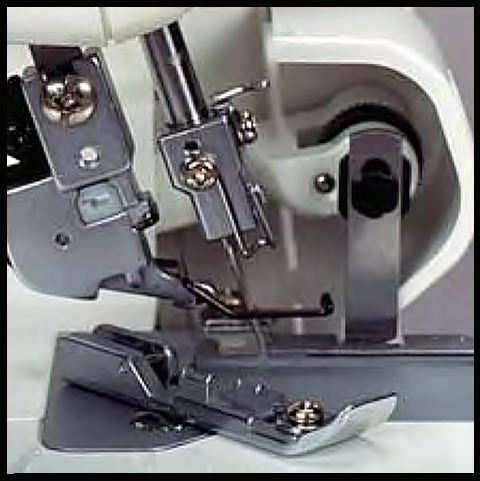 Your front presser foot can be lifted extra high so you can work on thick fabrics or layered projects. Seams are super easy built-in guidebars to make guesstimating a thing of the past. The multipurpose standard presser foot can be snapped off and replaced with one of many specialty snap-on feet! Don't miss one of the best features of the Juki MO735 - the higher-than-average pressure foot lifter that lets you add or subtract pressure according to the fabric being sewn! The Juki MO735 can sew up to 1500 spm and comes with a Juki warranty of 2 years on electrical parts, 5 years on most mechanical parts as well as 90 days from purchase for any adjustments that can be processed through your Juki dealer. Expand Your Sewing Creativity With The Juki MO735! The color-coding thread path system makes threading fast and easy. All you have to do is follow the color indicators and lay the thread into the guides. 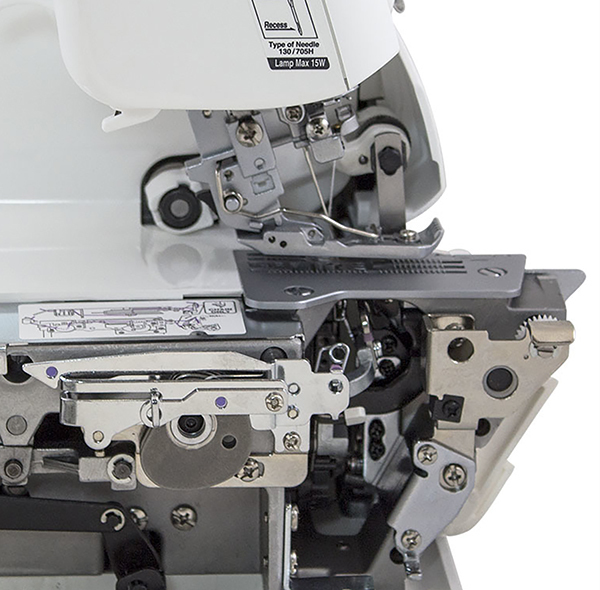 The MO-735's knife system runs with a dedicated drive to assure smooth and consistent cutting on a wide range of fabrics. With the extra-high front foot lift you handle thick fabric, or layers of fabric, with ease. The adjustable foot pressure dial allows for foot pressure to be decreased or increased to handle any fabric. I love this commercial embroidery machine it is exactly what I needed and very easy to use. Perfect! Love this machine! The manual is not good at all, but videos on You Tube make it all clear. You get a lot of features for minimal money. If you need the air tube automatic threading, go ahead and pay more for fewer functions. If you are not afraid of threading and setting up for different stitches, and adjusting tension as needed, this machine is for you. Not as easy to thread as I had hoped. This is my first serger. 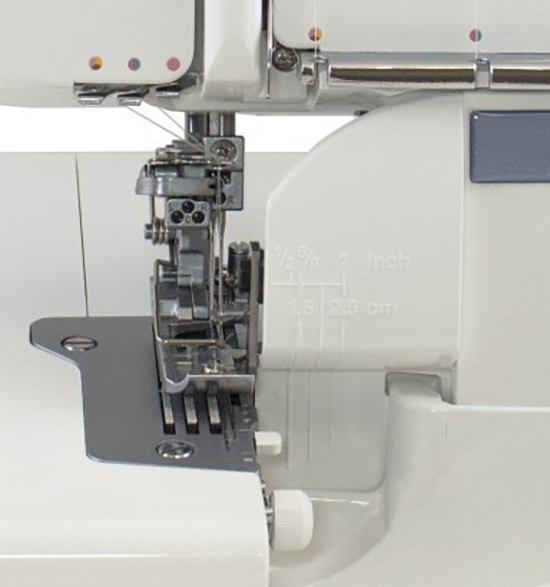 I did quite a bit of research and knew I wanted coverstitch and serger together. After reading all of the reviews, I took the plunge and decided on this one. I set aside an hour to get to know it, and sought out all of the helpful YouTube videos. Threaded it up, and it was amazing. For four test seams. On the fifth go, the stitching hung for a second, and then the stitches started to look funny. Somehow, a needle from the needle plate got caught and sewed itself right it into the serged seam, bending on the way out. It turns out that those needles are glued in, and none too securely. I called SewVacDirect and received outstanding customer service. The crazy part is that the whole needle plate had to be replaced -- I couldn't just replace the single needle. SewVacDirect offered to send a UPS label to pick up the machine or send me a new part. I opted for the new part since it was an easy fix, but it was out of stock. I was shipped a new one out about a week later and set down to sew again. I got through a pair of pants and a sleeve for a shirt, and the same thing happened! Talk about frustrating! This time, however, it was the straight needle that came unglued, and it had not bent on the way out. So I decided to get a little creative. I grabbed some epoxy and very, very carefully epoxyed that thing in. Voila! It now works like a charm. I would say that this is something very minor. Considering it came in an unopened Juki box and I did not pay dealer prices (who would have inspected and serviced it before I took it home), I consider this to be a great buy. Great machine. I have had a Juki serger for nearly 30 years and it finally wore out. Hope this one will perform as well--so far it is great. This is the standard Juki serger foot that originally came on the Juki MO-735 serger.